All in all the experience was better than I expected. The crew worked in horrible weather; minus 30's and later on, deep clay mud. They were professional, polite and a great crew. Our sales person was fabulous. He worked with us continually through any and all problems/delays that we had. Some of the issues we had with the project were significant delays, a broken front window (that was replaced) and a breakdown in some communication resulting in us having to take days off work with no workers ending up coming. All in all the work that was done was excellent, our sales person was on top of everything and even though it took a year from start to finish he stayed with this project until the end. I found dealing with your company was a positive experience. The sales rep was very informative and listened to my concerns and requirements. The installation crew was great and they explained thoroughly what they were doing and answered my questions and concerns. 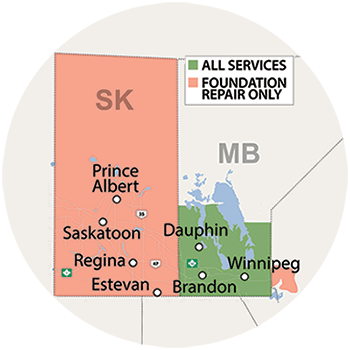 used Basement Systems of Winnipeg before, your company seems to have replaced them. So, 'took a chance' on you guys. Exceptional crew... Nat was very informative every step of the process. Great crew she leads and works with. Nat was a very experienced & caring person who obviously takes great pride in her work & the customer's wants & needs. She went above & beyond in my opinion, even securing the cord for the pump so it won't get in the way of anything. The installation crew did a great job, we are very happy with the outcome. They were efficient and friendly.